In a time of market volatility, customers can depend on the experience and stability of our “in-house” experts. Think of the benefits of having your own in-house structural steel facility… There are many major worries that you could eliminate from your day-to-day operations. Things like quality control, transportation costs, and material issues would no longer keep you up at night. The biggest problem with this dream might be the overwhelming start-up costs. Just purchasing the machinery can put you in the red for years, not to mention hiring and training workers to both operate and maintain the equipment. It would be ideal to find a solution for the inkling of hesitation. At Macuch Steel Products, we have the tools for this age-old problem. Our biggest goal is to bring customers all the benefits of an in-house structural steel operation without the costs and staffing headaches. In many ways, Macuch is six outstanding companies under one family-owned and operated umbrella. Each of our divisions offers contractors unique services that act like your own personal in-house operation. Our full-service shop provides clients estimating, budget pricing, detailing, engineering calculations, fabrication, welding, shearing, bending, punching, painting services, and installation. Since the 1960’s, builders all over the Southeastern U.S. have come to Macuch for their rebar needs. 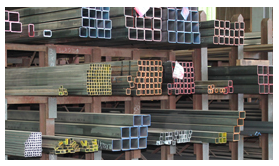 We supply just about every type of rebar you will ever need. As well as carrying a wide range of steel products, Macuch will also cut, punch, bend, weld, and paint steel to our customers’ specifications. Located just outside Savannah, this smaller offshoot of Macuch mainly focuses on heavy welding high-man-hour-per-ton types of work. This facility fabricates steel in lengths typically up to 60′, widths up to 17′, and weights that range up to 10 tons, with 170′ lengths. If you need efficient and cost-effective installation and erection of structural or other steel products, our subsidiary Shewmake is the perfect choice. We have the experience crew to operate cranes, lifts, trucks, and welding equipment to complete all of your projects. If you need high quality stair and rail products, including ladders, compound radius stairs, grating platforms, grating treads, hand railing, ornamental railings, monumental stairs, primary egress stairs, and guard rails then Southeastern Stair & Rail is the perfect choice. By allowing the divisions that make up the Macuch family to handle all the services above, you get personalized service without having to pay the often-debilitating cost of bringing everything in-house. It’s a win-win for everyone involved. If you want to learn how to eliminate your next contracting head-ache, please visit our website. We also post more industry news on our Twitter and LinkedIn pages.